Sometimes a simple stretch can help your horse with a movement that may be a bit ‘sticky’. Before you stretch your horse, warm the muscles. You can do this by walking your horse for ten minutes, or massage the area you intend to stretch. Ensure your horse is squared up behind and on balanced ground before picking up the foreleg. It is important your horse relaxes into the stretches because if he tenses you will find it difficult to achieve the desired results. Your stretches should always be slow and gently moving into a slight resistance. Do not tie a horse for these stretches, having a handler is better so they can also guide your direction and help the horse keep his balance. A handler will help you stretch your horse in his natural line of movement. As a guide, begin with a 10 second hold when stretching your horse, as your horse gets used to being stretched you can extend this to 15 seconds, eventually as he accepts the stretch hold for 30 seconds. Keep the stretches short in durations and small in size to begin with. Begin by picking your horse’s leg up as if you were going to clean out his feet, gently support his fetlock in one hand and do small circles or give the leg a light jiggle to help him relax. Then have your inside hand come in between his front legs and rest your hand above the knee behind the fold. Stand up straight and let his knee rest against your inside knee, meet his resistance, take a breath and then take up the slack towards your belly. Hold the limb for the required time and if the horse wants to stand down on you, raise the knee slightly. Ideally the radial and ulna bones are parallel to the ground. When you are first teaching your horse you may want to give him a break by returning his leg to the ground between each stretch. As he learns what you are asking of him you can do three gentle stretches in one session. When a horse is restricted in his movement here he may become resentful when being saddled, and if the deeper pectoral muscles has become tense and painful it can appear as heaviness or to be on the forehand. You can then continue into a triceps or shoulder flexor stretch by cradling your arms behind the knee and gently lift upwards until you meet his slight resistance, as he relaxes you can lift slightly higher to complete the stretch. The triceps is a three-headed muscle with three places of origin that work in combination to extend the elbow joint, flex the shoulder during its swing phase of the stride and also play an important part in stabalising the forelimb. Return to the beginning of the girth stretch position and then step to the side of the horse and towards his tail and rest his knee against your thigh/hip is resting on the radial and ulna bone, ease your hip towards his chest and again meet the resistance and take up the slack, this stretch is good for the lateral muscles, especially for the horse just beginning to learn lateral movements. Whenever stretching your horse’s legs, do not fully extend the leg. You do not want to hyperextend any joints. You may have noticed your veterinarian stretch your horse’s foreleg out fully, this is not a stretch for you to perform because the leg is not able to be moved into a stretch affectively. Your veterinarian is doing this for diagnostic purposes. It can also teach your horse to bear down on you with his weight. One of my favourite stretches assists the biceps brachii that branches over the point of shoulder. Pick up the foreleg and have the fetlock resting in your hand, this hand is simply to support the leg. Make sure the cannon bone is parallel to the ground and avoid closing the limb any further so as not to over flex. Let the leg relax and bring your hand in front and above the knee and gently guide it back towards his rear. When a horse is restricted here the biceps brachii in conjunction with the brachialis muscle is not able to lift the foreleg forward while flexing the elbow, I often find horses with limited extension respond to this stretch. These stretches are simple and can be added to your weekly routine. I often recommend to clients stretch a body area once a week. Each session includes a series of stretches such as those above, and you only need to do three (3) of each stretch in a session to help your horse’s muscles. Never force your horse to do any of the stretches, you simply meet the resistance of the muscle and guide the muscle to open up to your request. This will achieve more results than a ‘yank’ or forced move. If your horse continues to resist a particular stretch you may need a specialist bodywork therapist or your veterinarian to assess your horse’s muscles in this area. Your horse’s back can become sore if he has slipped, caught his hip on a gate latch, pulling back on a lead rope when tied, been cast in his box, pulled his leg through a fence, ridden over a change of surfaces, had an accident in a float, or suffered from poor shoeing or an ill fitting saddle. There are a number of signs to look for to indicate if your horse’s back may be sore. Your horse may not want to move straight along the long side of the arena, he may become unbalanced in the canter, be unable to change diagonals easily at the trot on a circle, may go wide when asked to lengthen at the trot, have difficulty walking in a straight line down an incline, unable to track up, unwilling to lower his head and accept the bit. You as a rider may feel a loss of contact with one side of your seat, tension in your horse’s back or feel like you are riding ‘downhill’, feel twisted in the saddle or one of your stirrups feels longer than the other when it isn’t. Also consider your horse’s back is sore if your back is sore after riding. Rock the horse gently with your hands over the spine to start to relax your horse’s back. With this stretch we are assessing where there may be resistance to bending his back in either direction. The muscles you are targeting here are the para spinal muscles by encouraging contraction in the opposite side of the spine using our fingers in a crescent stretch. Rock the horse to use the momentum. Lay the pads of your fingers on the opposite side pressing gently to get a contraction on that side and have him bend around your fingers. This will give you a stretch in the muscles on the side you are on and also give you an indication if there is any muscle spasm causing your horse discomforted if the contraction under your fingers is resistant. Use both sides with your hands close together with your arms close to your sides and your knees bent. Place your fingers pointing up and along the midline beginning just below the elbow and run your hands back to where the texture of the coat changes. Stand up holding as he lifts his back and try to make him lift his back in a slow controlled manner. Then hold for ten seconds. Then tickle him just behind the wither so he drops his back again and repeat the stretch. I find three belly stretches from each side of his body helps with the strengthening and development of the longissimus dorsi muscle. The longissimus muscle connects the sacrum to the wither and runs the length of the back. This muscle helps stabilise the spine during movement and allows the limbs to swing through the phases of contraction and retraction. This muscle needs to be strong, yet subtle, so the rider is able to bring the forward movement from the hindquarters through to the neck. The intention with these stretches is not to manipulate, they are to increase the range of mobility and have a horse able to carry you with ease. If your horse’s sore back or riding issues persists, please consult a professional. Your veterinarian, saddle fitter, or body worker will be able to assist you. The longer an issue has been within the body, the more time you need to address the muscles. A soreness that has been present for a week will melt away almost immediately, but one that has been there for months or years will need to peeled away a layer at a time. For any stretches of the back make sure all your horse’s legs are square. This way you will be able to target the muscle groups you desire with ease. The horse’s neck is his main balancing mechanism. The horse often goes into co- contraction as a protection against loss of balance, and in doing so may create tightness in his neck that does not relax when he does. This can affect your carriage when asking for your horse to come onto the bit, and if long term in its nature, the ability of your horse to collect and come through from behind. As a rider you may notice your horse is resistant to flexions of the poll and neck, your horse may not ‘settle down and feel like he is jarring in the front, become defensive to your hands, or develop limited extension as the trapezius and rhomboids tighten in response to the tension in the neck. When you are ready to stretch the neck, it is preferable that your horse has a relaxed neck. Do not force any of these stretches. A simple technique to relax the neck is called jostling. 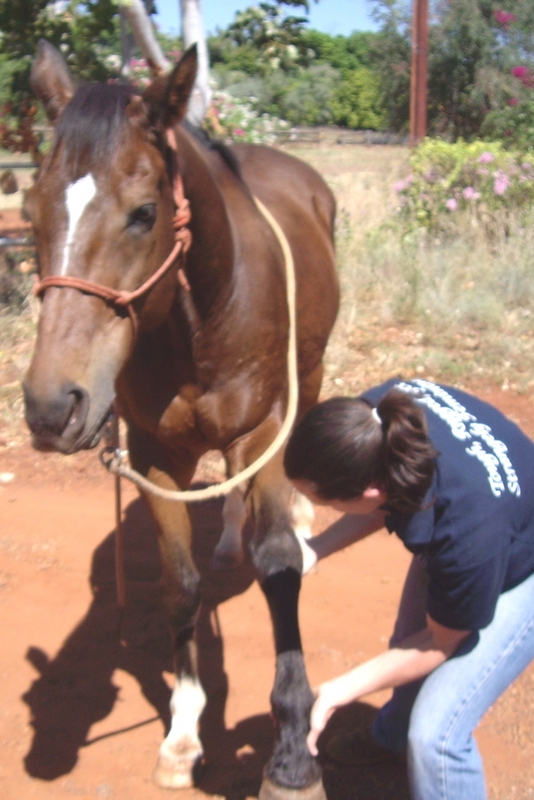 This technique involves cupping your hands over the crest of your horse, placing your thumbs at right angles, and then rolling the crest towards your thumbs. This can be done with a light pressure to begin with, and can become a stretch in its own action if held where you find any resistance. Place one of your hands over the poll to stabilise the joint before your begins and one hand underneath the chin where it is comfortable for the horse. Keeping your arms close to your body for support lift the chin hand to relax in a rocking motion. You will feel him give and relax. It is important your horse is relaxed for this stretch so once he is go and stand in front of him and move the curve of his chin on to your shoulder. Place the one hand behind the poll and ears and the other on the halter to keep his head from swinging into you. Once he gives his weight, encourage him to extend his nose by leaning away from him, this will have him lowering his poll and neck. You may have to step back to accommodate the movement. This is a wonderful stretch for the poll flexors and the ventral neck muscles. It is like giving your horse a big hug and I find it very effective when I am massaging a horse that is tight in the poll. Using a carrot as the target is not ideal but sometimes unavoidable when teaching a horse a new stretch. The horse tends to give you a ballistic contraction rather than a slow controlled stretch. If you practice these stretches often, you will find your horse will do them willingly for a scratch or tickle. To stretch your horse’s neck and back you can ask the horses nose to come to the ground. Place the carrot between the legs below the knees and ask him to reach through, if he steps back he has not completed the stretch so do not reward him and ask him to do it again. As well as getting him to touch low in front of his legs you can also ask for a lateral stretch where you place the carrot on the outside of his cannon bone or as he becomes more flexible the outside edge of his hoof. It is very important with this should be placed well below the knee, if you ask your horse to reach between his legs above the knee you may risk doing damage to the vertebral column. With these carrot stretches, two or three times in each session is sufficient and make sure you work side to side when stretching the neck. This is more effectively than one side only. If you use stretches in your weekly routine with your horse you will assist him to give you what you ask of him athletically. I would like to thank Debranne Pattillo of Equinology Inc for introducing me to this concept of stretching. For further reading one book I have found useful in understanding how muscles affect movement is The Horse’s Muscles in Motion by Sara Wyche and Understanding the Horse’s Back by Sara Wyche. If your horse develops any neck stiffness after a fall or accident, please have your veterinarian assess your horse to ensure there is no damage to the vertebral column or other underlying disease states.